These chicken breasts get flavor from apples, apple juice, and thyme. A bit of apple cider vinegar and onions balance out the flavors. It's an easy preparation and makes a delicious everyday meal. 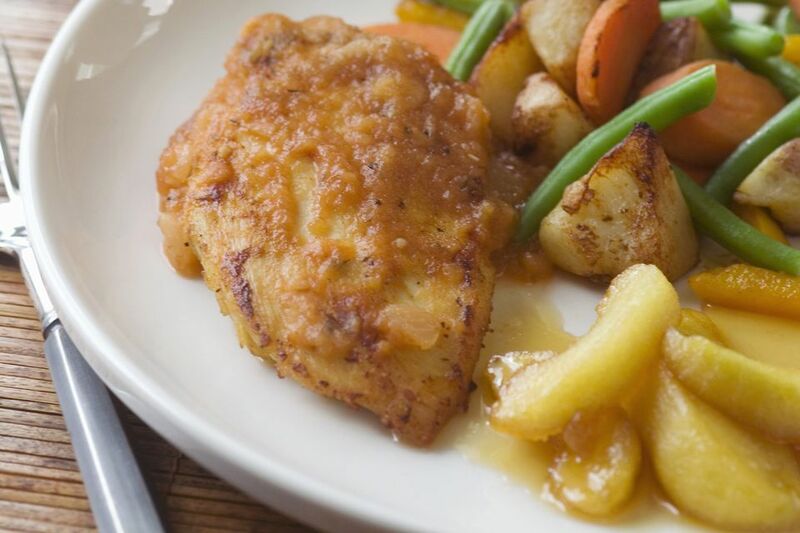 Serve the chicken and apples with baked or roasted potatoes and a salad or steamed vegetables. Peel and core the apples. Slice them into thin wedges. Peel the onion and cut it in half. Cut the halves into thin slices. Heat 2 teaspoons of olive oil or canola oil in a skillet over medium heat. Add the sliced apples, onion, and thyme; cook for about 4 minutes, or until the apples are just tender but still firm. Stir frequently. Transfer the apple and onion mixture to a bowl and set aside. Add the remaining 2 teaspoons of olive oil or canola to the skillet. Add the chicken and cook for about 4 minutes, or until golden brown on both sides. Reduce the heat to medium low. Set 1 tablespoon apple juice aside and pour remaining juice into the skillet along with the apple cider vinegar. Cover and simmer for 6 to 8 minutes, or until chicken is cooked through and juices run clear. With a slotted spoon, remove chicken to platter and keep warm. Combine the cornstarch with reserved tablespoon apple juice; stir into skillet juices and cook over high heat, scraping up browned bits, for 2 minutes or until the juices are thickened. Return the apple mixture to the pan and heat through. Taste and season with salt and pepper as desired. Arrange the chicken on a platter and spoon the apple mixture around it. Serve hot.